Grampian Fortress is the first in the series of two F-Class emergency response and rescue vessels ordered by Craig Group. Image courtesy of Craig Group. Grampian Fortress emergency response and rescue vessel was launched in August 2015. Image courtesy of North Star Shipping. Grampian Fortress ERRV at Balenciaga Shipyard in Northern Spain. Image courtesy of North Star Shipping. The vessel was launched by Balenciaga Shipyard in August 2015. 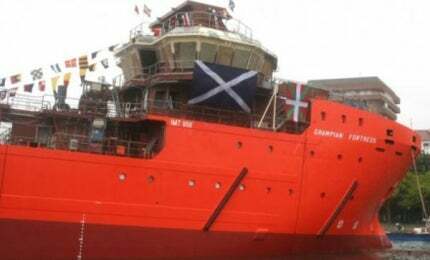 The second vessel in series, Grampian Freedom will be launched in the second half of 2015. The new ERRVs will be operated by North Star Shipping, a part of Craig Group. The two vessels are being built as part of a £70m investment plan announced in September 2013 for the construction of two F-Class IMT 958 and four D-Class IMT 950 ERRVs to add modern vessels to the fleet. The IMT 958 is a multi-role field support vessel designed by Offshore Ship Designers (OSD). The mono-hull vessel can house daughter craft and fast rescue craft (FRC). It is also designed to carry limited deck cargo, fresh water and fuel. "The vessel was launched by Balenciaga Shipyard in August 2015." The vessel has an overall length of 58.2m, breadth of 13.2m, draft of 4.75m, depth of 6.25m, and deadweight of 980t. The Grampian Fortress ERRV offers a deck area of 50m² and deck loading strength of 5t/m. It is installed with a 2t electric-hydraulic crane and a deck tugger. The vessel features control positions at bow, aft, port and starboard sides, as well as a fully integrated joystick control system. The ERRV can be optionally fitted with dynamic positioning (DP) system, fan beam laser, differential global positioning system (DGPS), and Radascan and Cyscan systems. The vessel has storage facilities for 394m³ of fuel oil, 369m³ of fresh water and 650m³ of ballast water. The ERRV carries a McGregor heave-compensated davit for launching Delta Phantom daughter craft and a McGregor davit for Avon 15-man fast rescue boat. Grampian Defiance is the fourth and final ship in the series of four new D-Class ERRV constructed in northern Spain. Other ERRV equipment aboard the vessel include a 6m Dacon Scoop, a 2t Dacon rescue crane, a Cosalt rescue basket, Jason cradles frames, two winch zones, two dispersant tanks, dispersant spray booms, and four IBAK Kiel searchlights. The navigation systems aboard the vessel include two Furuno S-band and X-band radars, a Furuno aft radar, an electronic chart display and information system (ECDIS), a personal locator beacon (PLB) system, Furuno DGPS, Anschutz gyro compasses, an autopilot, a Gillie 2000 magnetic compass, a FE 700 ES echo sounder, a Furuno digital depth recorder (DDR), and a Furuno navtex receiver. The ERRV is equipped with three UHF units, FM 8800 GMDSS, ICOM ICM VHF systems, an ICOM helo radio, a Jotrun automatic identification system (AIS), a Taiyo VHF direction finder, a Furuno DS 80 Doppler, a Furuno Felcom ship security alert system (SSAS), six portable VHF and three portable UHF units from Entel, three Jotrun portable VHF systems and two Kenwood portable UHF systems, four Mk10 sonic helmets, and an ICOM PS1 smart-patch phone. The ship offers crew cabins to accommodate up to 20 personnel. It is equipped with a mess room, as well as recreation and leisure facilities such as two lounges, a sauna and a gymnasium. The propulsion system integrates four Caterpillar 550kW main diesel engines, azimuthing stern drive units, two bow thrusters, and two stern thrusters. Each bow thruster develops a power of 600bhp, whereas each stern thruster is rated at 1,200bhp. The shipboard electricity is supplied by an emergency genset. Ships Electronics Services (SES) has over 35 years' experience within the leisure, fishing, commercial shipping, military shipping and offshore oil industries.